Homemade turkey noodle soup is an easy recipe that is perfect for using up leftover Thanksgiving and Christmas turkey. This hearty soup is packed with vegetables and noodles, and is a classic comfort food that will warm you up on a cold day. It will soon be your family's favorite turkey soup recipe! Over the years, turkey noodle soup has been one of my favorite ways to use up leftover roasted turkey from Thanksgiving and Christmas. I just love the smell of the turkey soup simmering on the stove–plus, it’s so comforting to have on a cold day! Make up a big batch of this soul warming soup, and freeze some so you can enjoy a bowl or two when you’re feeling under the weather. This turkey soup is made with homemade low sodium turkey bone broth, so its packed with extra nutrients. What spices are good for turkey noodle soup? Earthy spices like thyme, oregano, rosemary, and bay leaves. Other popular spices are sage, basil, parsley, marjoram, salt, and black pepper. What vegetables are good in turkey noodle soup? Can I freeze turkey noodle soup? Yes, but follow these steps for the best results. Let it cool completely. If you’re in a hurry, put the soup in smaller containers without the lids, or set the soup pot in an ice bath and stir occasionally. Noodles: Noodles turn to mush when reheated, so add them when you reheat the soup. Under cook vegetables: If you choose to add potatoes, under cook them so they don’t go mushy when frozen. Cream or Milk: If you choose to add dairy, it will have a grainy texture and will separate when frozen. Add it when reheating. Delicate Ingredients: If you choose to add ingredients like lemon juice or grated cheese, add them after the soup is reheated. Overfilling: Liquids expand when frozen. Leave one inch head space so the containers don’t break. Under-filling: When there is too much air inside, freezer burn can happen faster. Saute the onions and garlic in oil in a small skillet until soft and fragrant. Add all the ingredients, except the turkey, noodles and garnish, to the crockpot. Add the cooked turkey during the last 30 minutes. Cook noodles separately, then add them to the serving bowls, and ladle the soup on top. Garnish and serve hot. Gather all the ingredients. Slice the celery and carrots, chop up the onion, and mince the garlic. Finish by cutting the turkey into bite size pieces, and the fresh broccoli into florets. Saute the carrots, celery, and onions in oil until the onion is soft. Add the garlic and cook until fragrant. Add the diced tomatoes, okra, broccoli, and turkey. Feel free to customize the vegetables. Pour in the homemade turkey broth. Add the spices (rosemary, basil, thyme, oregano, salt, black pepper, and bay leaves). Stir until well combined. Cover the soup pot, and bring to a boil over medium high heat. Reduce heat to medium low, and simmer for 30 minutes, stirring occasionally. While the soup simmers, cook the noodles separately. To serve, put some noodles at the bottom of each bowl and ladle the hot soup over top. Garnish with fresh parsley and a few cracks of black pepper. Serve with a crusty bread. Use homemade turkey stock for the best flavor. Don’t have leftover turkey? Roast 1 1/2 pounds of turkey drumsticks. Don’t have egg noodles? Try other pasta like rotini. Don’t like the vegetables I used? Choose your favorites. Try red bell pepper or potatoes. Want rice? Swap out the noodles for long grain rice or brown rice. Cook separately and add to each bowl. Want to thicken the soup broth? Puree 2 cups of the soup, without the turkey, and add it back in. Want a creamy soup? Add 1/2 cup heavy cream, evaporated milk, or coconut milk at the end. Love lemon? Add 1 tablespoon during the last two minutes of cooking. Not enough broth? Add 1 to 2 cups of water and adjust seasonings. If you have leftover turkey in your fridge or freezer, I encourage you to try this recipe. It’s easy to make and can be on the table in under one hour. These other turkey recipes will be popular with your family. Crockpot Roasted Turkey Broth: this flavorful broth is easy to make ahead and freeze. How to Cook a Turkey: learn a simple way of cooking turkey–just like Grandma used to do. 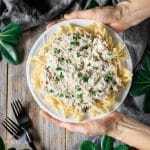 Creamy Turkey Stroganoff: a family favorite recipe that uses up leftover turkey. Did you make this turkey noodle soup recipe? Please leave a star rating below the recipe to share how you enjoyed it.